PPAF seeks to increase the availability and productive use of microfinance, and promotes the potential of remittances and microfinance for economic and social development. PPAF has collaborated with innovative organizations in Madagascar, the Dominican Republic, and Haiti, and has emphasized the role of women as senders and receivers of remittances. MICROFINANCE is the supply of loans, savings, and other basic financial services to the poor. It encourages and helps meet the needs of small entrepreneurs at the family level. The overwhelming majority of people who earn less than $1 a day, especially in the rural areas, continue to have no practical access to formal sector finance. Poor people need a variety of financial services, not just loans. By supporting women's economic participation, microfinance helps to empower women, thus promoting gender-equity and improving household well-being. REMITTANCES are transfers of money by foreign workers to their home countries. Money sent home by migrants constitutes the second largest financial inflow to many developing countries, frequently exceeding international aid. ​Haiti $1.5 billion; Madagascar $10 million. ​written by Hans Dellien and Olivia Leland (2006), 129 pages long in the French version. The intern also translated from English into French a microfinance business plan originally prepared in the Dominican Republic by Esperanza International. ​ PPAF also helped in marketing the project to potential investors and donors. 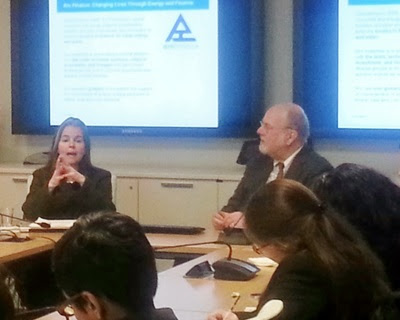 PPAF worked with Carlos Pimentel and Dave Valle of Esperanza International, a non-profit in the D.R., and mentored two Columbia University graduate students to prepare a proposal to Western Union Foundation. The resulting $10,000 grant provided assistance in financial literacy training and cash support to microenterprise lending in the D.R. through Esperanza International. Seventy representatives from the UN, the private sector and civil society met on July 16, 2008 for deliberations on “Partners against Poverty – Awareness, Agreements and Actions”. 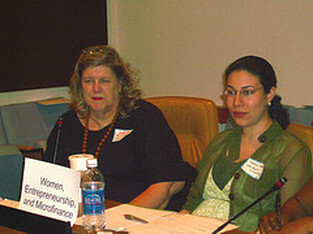 This second annual meeting treated a range of topics, with a special emphasis on women, entrepreneurship and microfinance. 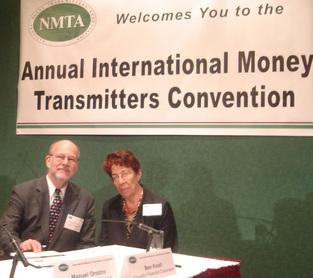 PPAF focused on policy issues of remittances and development at the International Money Transmitters Conference, held in Fort Lauderdale, Florida in November 2007. 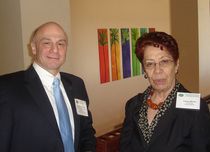 Over 300 participants from the U.S. and other countries attended the sessions. PPAF arranged with the organizers for Dr. Carmen Moreno, Executive Director of UN-INSTRAW to speak - on gender issues, migration, remittances and development. She noted that women are about half of all migrants, and represent half of senders of remittances and 70% of recipients. A month before the Foundation was officially registered as a non-profit corporation, team members including Amb. Francis Lorenzo and David Stillman joined with UNDP, the Dominican Government and FUNGLODE to convene the Regional Consultation on Migration, Remittances and Development in Latin America and the Caribbean, which was held in Santo Domingo, D.R. This brought together 75 representatives from 13 countries. 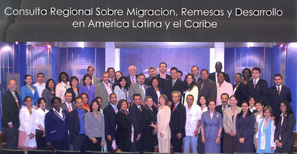 The Dominican Government submitted results of the conference to the UN General Assembly.